"It's like magic. I can’t put into words the transformation that has happened since my daughter got Bella"
Elizabeth Pettit shares the story of her daughter Rebecca's new life since Bella arrived to their family. "Life before Bella, our autism assistance dog, was hard. It was hard to do anything. My daughter’s diagnosis of autism was like a death sentence. We were terrified of how she would cope. Before we got Bella, Rebecca was living in a ball of anxiety. She was so overwhelmed with the world. She was imprisoned by the anxiety that is very often a symptom of autism. It was like her body was in overdrive with distress. Simple things like going in to a shop with Rebecca were a nightmare. She would run away, go into places she wasn’t allowed and we were like an army around her trying to keep her safe. She found it so difficult and distressing and so she would try to run away. Can you imagine trying to find a child who can’t speak or can’t protect herself? To be honest, everyone was always anxious, my other two children, Tomas and Leah, my husband, myself. If we went anywhere, strangers were always looking at us. You end up leaving the world. Rebecca went to a ‘special school’. No one knew her. She was so isolated. I was enabling her isolation. Autism causes this. Your child is distraught. Distraught by everything. You end up avoiding every single thing and place. Out of sight, out of mind. Society doesn’t have to worry about the children that they have forgotten then. When a child with autism, through having the support of an assistance dog, loses all that awful anxiety and fear, the child can learn, they can connect with others, they can become part of their community, educate people. Bella helps Rebecca go to places that she would have avoided, ran from. It is like magic. I can’t put into words the transformation that has happened since my daughter got Bella. We are all so much happier as a family now since we have Bella. Rebecca’s autism is out in the open, the community now know Rebecca. They have never seen more of her. She has moved to a mainstream school, even though she has limited speech, and this is all because of Bella. Bella is her number one carer, she is in tune with Rebecca and calms her before any of us know that Rebeccca is becoming distressed. It’s like she can sense the stress happening. Having Bella draws people to Rebecca. Before people were scared of Rebecca, they didn’t know how to interact with her, but now people come up to her and Bella all of the time. The dog is breaking the ice for my daughter. People now understand Rebecca’s disability and know that autism is nothing to be afraid of. It is wonderful, not just for Rebecca but for all of us, for all of our lives, for the lives of everyone in our community too. Because of Bella, we are all better people in our community. Strangers now come up to help if Rebecca is having difficulty. Before Bella, strangers just walked by puzzled. As a mother all you ever want is for your child to be accepted, to be accepted for who they are. My child was born like this. This is not her fault. When you see your child rejected by society, ignored, it breaks your heart. It’s awful. But Bella has been a guardian angel to my child. She is in sync with my child, she can even sense when Rebecca is going to have an epileptic seizure and alert us. Bella is the first being that has ever helped Rebecca remain calm, stay calm in situations that would have had her ill with anxiety before. Now Rebecca can concentrate, she can adjust to the world around her, she watches everything that is happening now and she has a great laugh. Rebecca’s speech has improved so much since Bella has taken away her anxiety. She uses Bella to calm down and soothe herself. 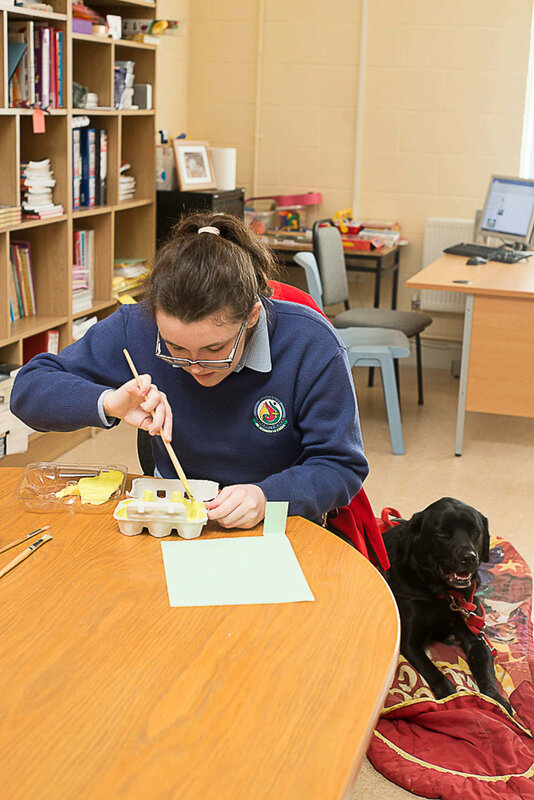 Because Rebecca is more relaxed she can enjoy her childhood and is no longer imprisoned by her autism. Bella knows that it is her job in life to take care of Rebecca. In new situations, she doesn’t let Rebecca out of her sight. The training Bella got from AADI was just amazing. It’s an absolute credit to the charity, to see what they are doing for these children and their families free of charge with no strings attached. Every child who needs the support of an autism assistance dog should be given one as a right. If children with autism, who suffer and struggle with this disability, are to be integrated in to society and not hidden away, then they have to have an autism assistance dog. No question about it. Autism shouldn’t be a ‘Them and Us’. Before my child was hidden from the world because of the distress that her disability caused her. Now look at her. She has gone from being in a special school to moving into a mainstream school. Rebecca and Bella go to school together every morning. She goes to new places, normal childhood things that would have had her climbing the walls with anguish before. She is being cared for by her community, she is being loved by her community, being understood. She is free from the claws of anxiety. What more could you want for your child and all because we got an assistance dog from AADI".